Play with Potential REC Coordinator Rose Phinick shares her recess experience. If you begin typing “Cornell Square Park” into the Google search engine, the word “shooting” is automatically suggested to complete the search phrase. Pages of news blotters cover the tragic shooting that took place last September, leaving thirteen people (including a three year-old child) injured. The incident grabbed national attention and is many people’s first impression of the South Side neighborhood. Those outside of the neighborhood have described it as a “warzone,” nicknaming it “Chiraq” after years of violence. I have coordinated the recess program at Daley Elementary Academy for two years through Urban Initiatives’ Play with Potential. When Chicago Public Schools first reintroduced recess as a required part of the school day in 2012, the Daley community wondered, “How are we going to have recess in Cornell Square Park?” The park, though spacious and cared for by Chicago Park District staff, was notorious as a hub of gang activity in the neighborhood. Many worried about the students’ safety and were afraid to stay in the park. However, we recognized that the benefits of an outdoor, active recess were too vital to pass up. When Urban Initiatives began the Play with Potential program, our mission was to provide students with an engaging and active recess. At Daley, we added another facet to our mission: the reclamation of public spaces. 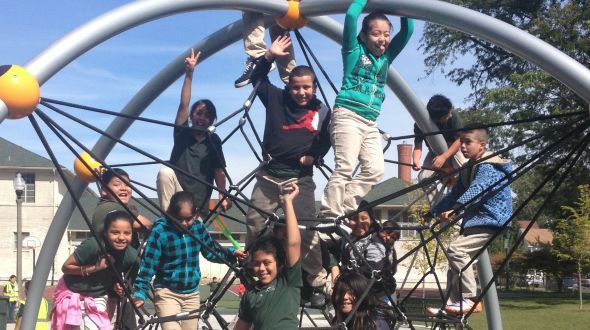 Thanks to diligent staff, dedicated parents, and support from the Chicago Park District, Daley students are able to enjoy recess at Cornell Square Park every day. Throughout my first year as the REC Coordinator, we watched the neighborhood begin to take notice of the children using the park. Gang activity in the park during the school day dropped. The once violence-plagued corner of 51st and Wood began to quiet down as community members respected recess time. The Daley community was committed to taking back the park. What was once seen as a center for crime was serving its original purpose—a safe space for children to play. Visiting Cornell Square Park today, one would see a very different picture than what they hear in the news. The park, recently revamped with a brand new playground, is teeming with life. Children splash in the water fountain, climb on the play structure, run along the sidewalk. Laughter fills the air as kids kick a soccer ball across the field. The basketball court, just one year ago marked with blood and police tape, is filled with children starting a pickup game, sharing high-fives and encouraging words. It is a magical place, where children are working together to shift the climate of their neighborhood. It’s recess time. Racing through the soccer field with my students toward our school after recess, I can’t help but reflect on how much has changed in the past few years. Our Daley community is a testament to the possibility of peace, that change is possible. There will be setbacks, but I know we are changing the story when people think of Cornell Square Park. There is so much more to it than what people see on the news. I see hope, resurrection, and love. Every day, I see a community working to create a brighter future for Chicago’s children. I am humbled every day by the resilience of the community I work with, and I am honored to stand strong together for a more peaceful future. All children deserve a safe place to play.